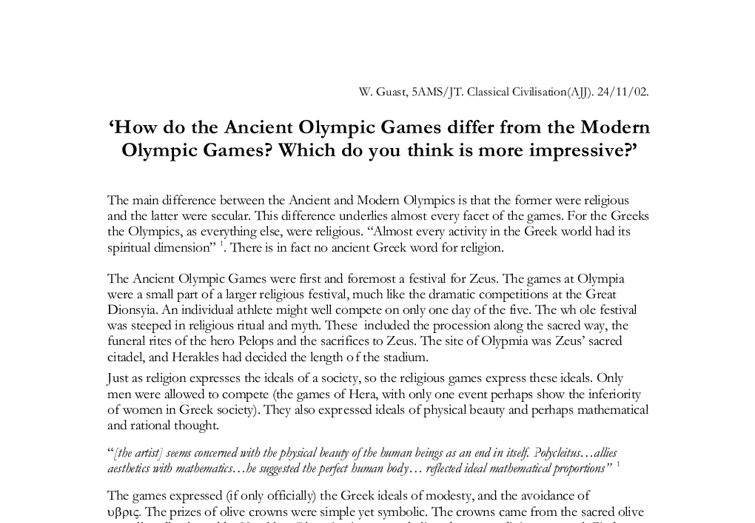 'How do the Ancient Olympic Games differ from the Modern Olympic Games? Which do you think is more impressive?' 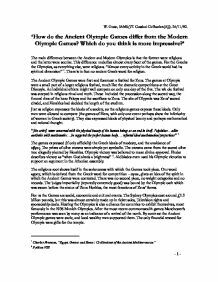 The main difference between the Ancient and Modern Olympics is that the former were religious and the latter were secular. This difference underlies almost every facet of the games. For the Greeks the Olympics, as everything else, were religious. "Almost every activity in the Greek world had its spiritual dimension" 1. There is in fact no ancient Greek word for religion. The Ancient Olympic Games were first and foremost a festival for Zeus. The games at Olympia were a small part of a larger religious festival, much like the dramatic competitions at the Great Dionsyia. An individual athlete might well compete on only one day of the five. The whole festival was steeped in religious ritual and myth. These included the procession along the sacred way, the funeral rites of the hero Pelops and the sacrifices to Zeus. The site of Olypmia was Zeus' sacred citadel, and Herakles had decided the length of the stadium. ...read more. There was no second place, no weight categories and no records. The judges impartiality (reputedly extremely good) was bound by the Olympic oath which was sworn before the statue of Zeus Horkios, the most ferocious of Zeus' forms. For us the Games are social, economic and cultural events. The Sydney Olympics cost around �1.2 billion pounds, but this was almost certainly made up in ticket sales, Television rights and sponsorship deals. Hosting the Olympics is also a chance for countries to exhibit themselves, most famously in the 1936 Munich Olympics. After the most recent commonwealth games Manchester's performance was seen by many as an indicator of a revival of the north. By contrast the Ancient Olympic games were static, and local wealthy men supported them. The only financial reward for Olympia were gifts for the temple. The Modern Olympic Games are primarily a cultural event. As such they represent many of the values of the international community. They are inclusive and tolerant. ...read more. thing that the Greeks agreed on: religion. I also prefer the purer form of the events in the Ancient Games. With no weight categories, no 2nd place and no records, competition at the Ancient Olympics must have been all the more committed. The events themselves were also simpler. The pankration, with fights until submission is far more accessible than Olympic Judo, with its array of confusing Japanese terms. But most of all the Ancient Olympics were more personal. In the modern Olympics our athletes compete thousands of miles away from home, often in the middle of the night, in a strange country. In the Olympic games people from all over the Greek world came together in a celebration and confirmation of their distinct identity. The victors were raised to levels far above those of modern competitors: the would give their name to the games, they would have songs composed to them, statues put up, coins struck and they would gain influence and prestige in society almost unimaginable to modern athletes. 1 Charles Freeman, "Egypt, Greece and Rome : Civilisations of the Ancient Mediterranean" 2 Pythian VIII W. Guast, 5AMS/JT. Classical Civilisation(AJJ). 24/11/02. - 1 - - 1 - ...read more. �(Then sighing heavily)� my dear companion has perished, Patroklos, whom I loved beyond all other companions, as well as my own life�Thetis spoke to him, letting tears fall� (377, Iliad, 18.78). It can be sensed that, although in deep mourning for his lost friend, Achilles is just as well upset because he sensed a slight degree of failure. + log [ In- (aq)]/ [HIn (aq)] The ratio of [ In- (aq)]/ [HIn (aq)] determined the color of the solution. When [ In- (aq)]/ [HIn (aq)] < 1/10, color of [HIn (aq)] is observed and there is no apparent change of color. Clytemnestra is loyal to Aegisthus even though they are not married. Electra is shown to be a whiney girl who wants people to see her humility. She has gone from a life of nobility, the daughter of the heroic Agamemnon, to the wife of a peasant. This is not nearly as impressive as the temple of Zeus also a peripteral temple, sizing at (27.68 x 64.12 m; 6 x 13 columns). The Heraion creates great excitement for me as its shows a clear translation of wood to stone within temple architecture. Both the Iliad and the Odyssey were written in an Illionic dialect (Ancient History). He wrote in a dactylic hexameter, a meter of six feet long containing one long syllable and either two long syllables or two short syllables, which suggest that they were, performed orally (Ancient History). Aeneas? piety is often defined by how he demonstrates stoicism, and he does so throughout the poem. Stoics believed that the notion of fate must be respected and that no mortal man could, or should interfere with fate, as it is an inevitable force.